This article was originally published on my WordPress blog – June 2017. 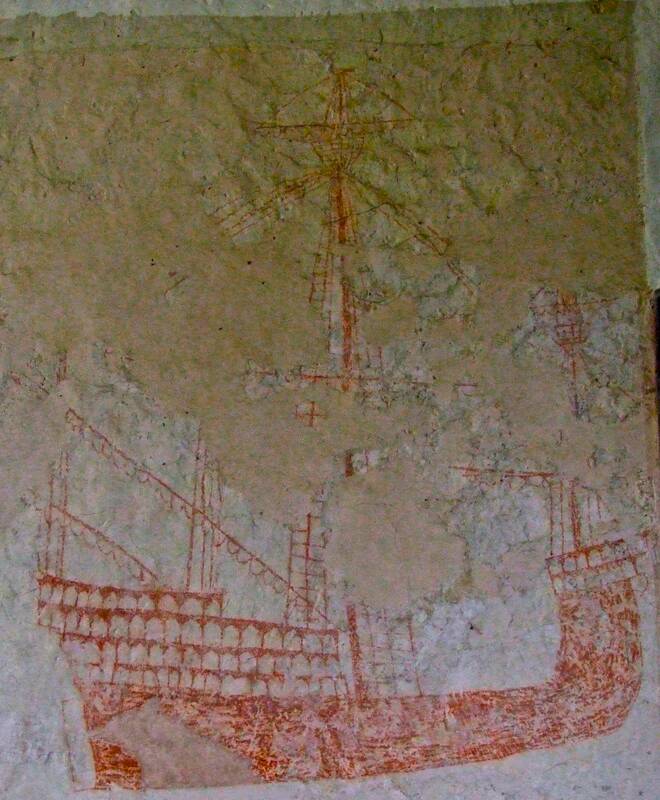 Why does a medieval church in a small Romney Marsh village contain a large and very old painting of a warship? The village of Snargate is about seven miles inland from the English Channel, a few miles north of the port of Rye. The painting was uncovered in the north aisle of St Dunstan’s church when old whitewash was removed in the 1960s. It is a big image, measuring roughly 1.5 by 2 metres (around 4 x 4¾ feet). The artist used red paint, now faded to a shade of terracotta. Expert opinion in the ‘sixties dated this picture to the period 1480-1520, based on the type of ship, and I would agree with this. According to local tradition, the painting of a ship on the north wall of a Marsh church, opposite the main door (as at Snargate), meant that it was a safe place to hide smuggled goods. This may be true, but the heyday of smuggling in the Marsh came a long time after 1500 and it is likely that the painting was made for a different reason (1). The ship is shown almost in silhouette. It was clearly not the work of a professional artist, and resembles a large, painted graffito. Despite this, the vessel was very carefully delineated: either the artist understood how real ships were put together, or was advised by someone who did. Parts of the ship are missing, due to lost plaster and the proximity of a later memorial, but a good deal remains, more than enough to make it possible to identify the type of ship and how it was rigged. The ship is a four-master, with tall superstructures, consisting of a two-deck forecastle at the bow and a four-deck aftercastle at the stern. The mainmast (centre) and the foremast (right) have topcastles (fighting and observation platforms) and topmasts. The yards and sails on these masts are shown facing the viewer, at right-angles to their normal orientation, and they carry four-sided square sails. The mizzen and bonaventure masts (left) have slanting yards designed for triangular lateen sails. The bow of the ship is higher than the stern, one of the defining features of a carrack, the biggest ship-type of the 15th century. The multiple arches shown in the castles are gunports, designed for small swivel guns – man-killers. By counting the gunports its possible to estimate that a ship of this kind would have had around 90 guns in the castles on each side of the ship, 180 in total. It’s usually very difficult – and often questionable – to make a link between a ship depicted in a medieval art and a documented vessel. There is some reason, however, to link the great ship of Snargate with a specific ship. One of the unusual things about this late 15th/early 16th century painting is that it shows a huge, heavily-armed, four-masted carrack. Ships of this kind were not common in England, but in the 1480s two royal carracks of this type, the Regent and the Sovereign, were constructed for Henry VII, the first Tudor king. The 600-ton Regent was built at Reding, around four or five miles from Snargate, in the years 1487-88 (2). Snargate (to the right) shown on the First Edition Ordnance Survey 1-inch map, published 1813. Reding Street and Smallhythe can be seen to the northwest, just above the Isle of Oxney. The choice of Reding as the building site was probably influenced by the proximity of the great medieval shipbuilding centre at Smallhythe, a couple of miles to the west. Henry himself visited Reding in August 1487, to view the construction work. The Regent was set afloat in the autumn of 1488, and towed down the River Rother to have its masts and rigging fitted at Rye. This was completed in the spring of 1490, and the ship was ready for sea by July of that year. The Regent saw relatively little action for most of its service life, but in 1512 it was destroyed by fire during a battle against a French carrack off Brest, with heavy loss of life (3). – rig: the rig of the Snargate ship is virtually identical to that of the Regent. There is also the matter of armament. The Snargate ship had enough gunports to mount about 180 guns in its castles. This figure may sound fanciful, but we know that the Sovereign carried 141 swivel guns in its castles, plus 20 guns in the waist (the open deck between the castles) and four at the stern. In other words, about 85% of its ordnance was in the superstructures. The layout of the ordnance in the Regentis not known, but it had 225 guns in total. Allowing for a similar disposition of weapons to that of the Sovereign, we would get a figure of about 191 guns in the castles, not many more than the number of castle gunports shown on the Snargate painting (4). Absolute proof is impossible, but I think that a good case can be made for seeing the great ship of Snargate as a representation of Henry VII’s Regent. If this is the case, it could also be the earliest-known English ship-portrait. Do visit St Dunstan’s church at Snargate, but check opening and service times first. Don’t forget to leave a donation for the church! (1) R S Sharman, A Guide to the Parish and Church of Snargate, Kent, 2nd Edition 1974, pp 8-9: the most recent edition of the Guide reproduces the earlier section on the Ship; Ian Friel, The Good Ship. Ships, Shipbuilding and Technology in England 1200-1520, London 1995, pp 157-70; there is a brief piece on the ship in G Nesbitt Wood, ‘Church painting of a 16th-century great ship’, Mariner’s Mirror, Vol 58, 1972, p 134. (2) Figures for the tonnages for these two ships given in various books vary from 450 to 1000 tons, possibly reflecting different tonnage calculation methods. However, the original order for building the Regent specified a ship of 600 tons, and this is followed here. (3) M M Oppenheim (ed), Naval Accounts and Inventories of the Reign of Henry VII 1485-8 and 1495-7, Navy Records Society Vol VIII, London 1896, xxi-xxii; G J Mayhew, ‘Rye and the defence of the Narrow Seas: a 16th-century town at war’, Sussex Archaeological Collections, 122, 1984, p 108; Susan Rose, England’s Medieval Navy 1066-1509, London 2013, pp 178-90; A Spont (ed), Letters and Papers Relating to the War with France, 1512-1513, Navy Record Society, Vol X, London 1897, xxiv-xxvi, pp 13, 49-50, 52, 59-60 and 63; Rose, op. cit., 189 reproduces a vivid contemporary illustration of the disastrous end of the Regent and La Cordelière. (4) Oppenheim, op. cit., pp 187-96 and 254-91.